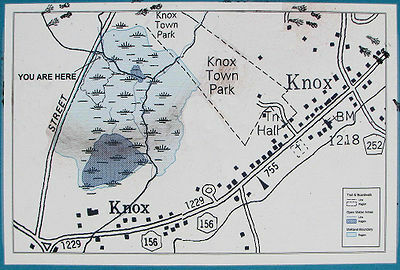 Knox Wetland is located off Street Road, between Knox Cave Road (CR 252) and Knox-Gallupville Road (CR 255). It's adjacent to the lower portion of Knox Town Park, where there's a small parking area. It's a short walk to the kiosk at the entrance of the wetland. The Town of Knox provides the boardwalk and woodland trail for recreation and education while protecting this valuable natural resource. Take only photographs and leave only footprints. If you carry it in, please carry it out. Everyone, including our furry and feathered friends, will appreciate your help in keeping out park clean. Help yourself to a Wetland Brochure and Trail Guide. You may keep it or return it to the box when you're leaving. What is a wetland ecosystem? The area of the Knox Town Park that you are about to explore is a wetland ecosystem. An ecosystem refers to all of the living plant and animals in a particular environment, and their interaction with the nonliving components such as the soil, water, air, and sun's energy. Wetland ecosystems are unique because the soils are saturated at or near the surface, whether all year or for extended periods during a significant part of the year. Wetlands are transition zones, exhibiting characteristics of both open water and dry land. However, the saturated soils in wetlands have distinct chemical properties that are different from more aerated terrestrial soils. The saturated soil conditions give rise to plants and animals that are specially adapted to living in a watery environment. How was Knox Wetland formed? There are two springs that feed this wetland. Exposed limestone bedrock found 100 feet west of Beaverdam Spring, drops off to the southwest indicating a buried bedrock escarpment. To the north, surface water drains by small streams into insurgencies at the Knox Cave and Skull Cave systems, and Two Second Pit. Groundwater from the cave systems travels approximately one mile through this bedrock, out the rock face, and through sediments to resurge at Beaverdam Spring just across Street Road. Northwest of here, water enters Triple Creek Sink on the Van Etten farm, travels underground approximately one half mile, the resurges at Barn Spring and continues to flow southwest into the wetland. How was the wetland formed? Over time, the outflow from Beaverdam Spring, together with other surface erosional forces, has cut a channel that meanders into a broad expanse of open water. Here, and throughout the Beaverdam Valley, limestone bedrock lies on 7-10 feet beneath the surface. Because limestone is solid rock strata, water will not sink through it the way it will through soil. This impermeable character of the underlying rock layers, coupled with the ingenuity of a colony of beavers, has caused this low lying basin to flood. The resulting marsh, wet meadow, and wooded swamp make up the wetland. Barn Spring, Beaverdam Spring, and the wetland they create are the headwaters for the Beaverdam Creek. From the beaver dam, water flows to the Foxenkill to the Schoharie Creek, to the Mohawk River, then to the Hudson and eventually spills into the Atlantic Ocean. Why is it important to protect Knox Wetland? Until recently, wetlands were generally regarded as wastelands that were impediments to development. Because little was known about the many subtle ways in which wetlands benefit people and other life forms, human impacts on wetland ecosystems have been staggering. When the first European settlers arrived in North America, there were roughly 215 million acres of wetlands. Drain, filling, dredging, damming, and the invasion of exotic species have reduced the number to roughly 99 million acres--less than half of the original amount. Estimates indicate that the U. S. is losing between 70,000 - 90,000 acres annually. New York has lost up to 60% of its original wetlands. Because wetlands provide biodiverse habitats, and safeguard and enhance our quality of life, it is important that measures be taken to protect our remaining wetland ecosystems. The Knox Town Board, with the assistance of many community volunteers, has undertaken the task of preserving, protecting, and restoring this wetland. Restoration, which means returning a system to it predisturbed condition, may involve replacing certain structural and functional aspects of a wetland, re-establishing the original landscape, or removing contaminated soils and planting appropriate native plants. At this site, a minimal amount of restoration is underway. The extent to which this area is "managed" consists of documenting baseline conditions, and monitoring natural processes by protecting the habitat from negative external influences. The field to your left has been systematically mowed over the past several years. Constant mowing has inhibited the growth of certain plant species while encouraging the growth of others. In an effort to restore the natural landscape, mowing of the area has ceased. Already, the field has become overgrown with grasses, sedges, rushes, and wildflowers. Shrubs and vines will move in next. Eventually trees may invade the field and extend the edge of the forest. This gradual change in the plant and animal community over time is called succession. The process is natural and happening continuously throughout the wetland. The karst features that sustain the wetlands are very effective in their ability to drain water. However, in this location, they do little to recharge groundwater supplies and contribute to the lack of dependable aquifers in this area. Nonetheless, we now understand that wetlands provide benefits for both humans and animals in a way that no other ecosystem can.